NewForex appeared on the market in 2014. It specializes in convenient trading conditions and online trading courses. Moreover, the broker advises on deals hedging and offers attractive affiliate programs. The company’s clients may open two types of trading accounts: First Streem and New Grade. The MetaTrader 4 platform provides traders with 25 currency pairs, futures on metals as well as CFDs on shares of 28 companies. Traders, who have already registered with NewForex emphasize several important advantages: unlimited initial deposit, access to swap-free accounts, 24-hour client support service, 30% deposit bonus, analytical reviews and the latest news on the forex market. Below, you can find comments about the broker as well as read about its pros and cons. Evaluate the quality of the company’s service and please leave a comment in the specialized section. What I liked about my experience with NewForex is the stability of their platform and the responsiveness of their customer service. I only encounter lagging in the platform when a news announcement is made. But aside from that, it runs smoothly. However, I think they will need to work on their educational aspect more. It is a plus point if a broker also provides some helpful articles or references to guide the novices. Although I appreciate that they made effort to provide some, I still find it a little insufficient. My cousin has been trading at NewForex for many years now and she was the one who introduced it to me and convinced me to start my investment here. She showed me her portfolio and I sometimes watch her while she trades. She has been making good money now and she told me that the money she spends on her overseas vacations comes from her profit in trading. I tried demo account first since I have no prior experience. The broker is good for my cousin because she already has years of experience. But for a newbie like me, the platform is too advanced and confusing. I think that this broker is best suited to professionals. I am glad to have joined NewForex. I've been on the search for a reliable broker for the past two years and I have always been disappointed until I found this. It has already been 6 months and all my trading transactions went on smoothly. The terminal is stable and the charts are synchronized with the real market time. The execution is also fast which is great. So far, I am enjoying my experience here and I guess the search is now over. NewForex has been my broker for a few months and so far, my experience is pretty average. What I like about this broker is their customer support system. They assign a representative who will help not only on the technical issues but on trading as well. So if I needed an advice, I can contact my rep and she will attentively help me. However, I cannot say that I am impressed with their platform. Sometimes the platform crashes and freezes. And during high volatility, the spread widens by 10-15 pips. 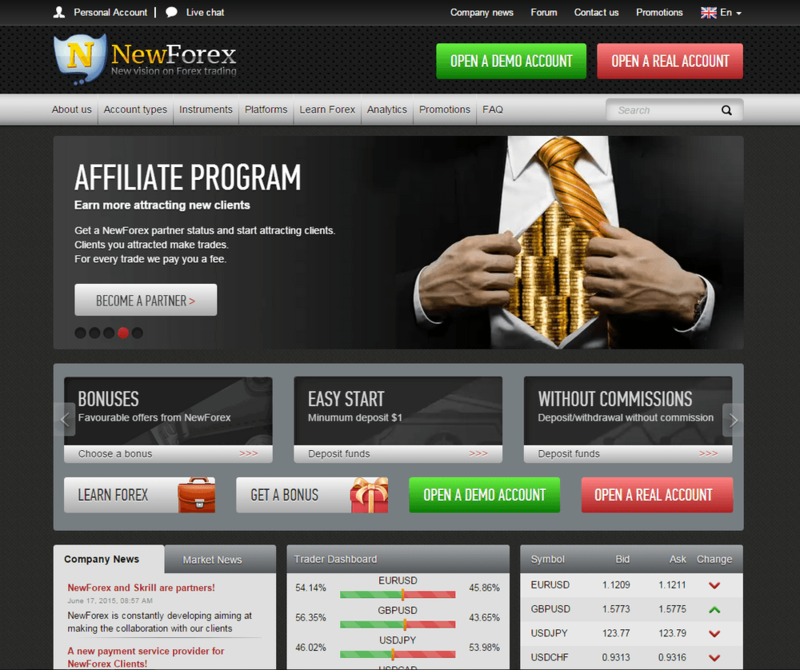 I am using NewForex and I my experience with them is excellent. I like to use of promotions of different brokers. I have opened an account with $300 and claimed 30% bonus on my deposit, surprisingly they send the bonus money instantly in my account. I have no problems with order execution and my customize EA runs great. I already withdraw 2 times using Qiwi first withdrawal was $150 and second was $200 both are processed within 4 hours. Well done and keep up the good work. I've been dealing trading with NewForex since 10 October and along that time I really like my trading experience here. I never had issues like suddenly disconnecting, delay in execution, or the platform freezing. Their trading condition really is the best for me. In October I got profit almost 45% from my capital deposit, so I wanna trading again in this broker until last week they blocked my account and send me an email that they due to system abuse they block my account. I am unable to trade with them and withdrawn my rest investment, but they don't explaint me the detail and do not answer my phone. Does it make any sense? because I just made trading during this time base on their system and conditions. I am very worry about it. Is there any trder who experience the same with me in NewForex ? I am trading with NewForex since 2015 and after 3 months of trading, I got profit almost 100% from my deposit capital. Initially I was searching too many forex broker to ensure that I am getting the right one. After searching for a while, I have found this broker give very clear information and its make me interst. Their MT4 trading platform working properly and currently I am working with a standard account to protect myself from huge losses. The initial fund allowed as low as $1, I am generating quite a stable profit about 30% to 50% in every trading. Besides I have followed their signal too, by their user-friendly mobile application I can make trading and profit every time and anywhere. I really recommend this broker and I wish more profitable trades with you guys! I liked trading with NewForex. They offered the best trading condition to their clients. I have been with them for 5 years and I've earned a lot by trading with this broker. Their platform is outstanding: instant execution, accurate signals, useful drawing tools, tight spread, and price synced to the real market price. I can't give all the credits to my own knowledge and strategy because if they didn't have a good platform, then I won't be able to smoothly execute my transactions. If in terms of withdrawal, I already took a total of more than 20,000USD. In the most recent one, I took 8000USD. I am thankful because even though my withdrawals are pretty large, I did not encounter any problem. In fact, I receive them in 1-2 days. Unlike with what I read about other brokers where clients are asked for every documents possible before giving them their money. Of course, I also submitted documents for verification. But once it was done, all my succeeding withdrawals were processed quickly. Trading has always been smooth with NewForex broker. Because of their fast execution, I am always able to open positions on the price that I want. They really aim to provide the best trading experience to their traders. Even when I was a newbie, around two years ago, I did not incur extreme losses. And that's mainly because of the educational materials that this broker offers. There are some tips and techniques that a beginner can try. Their regular market analyses are also very helpful even for experienced traders.